For the last couple of weeks, I’ve been introducing you to foot and ankle problems that are very common, despite their overcomplicated names. Today, I’m going to talk about another very common problem with a very simple, forward name – the ingrown toenail. And while the name is simple, it’s pretty descriptive, right? Sounds painful, too. That’s because often times, it is VERY painful. So, what exactly is an ingrown toenail? Well, it’s really exactly what it sounds like. 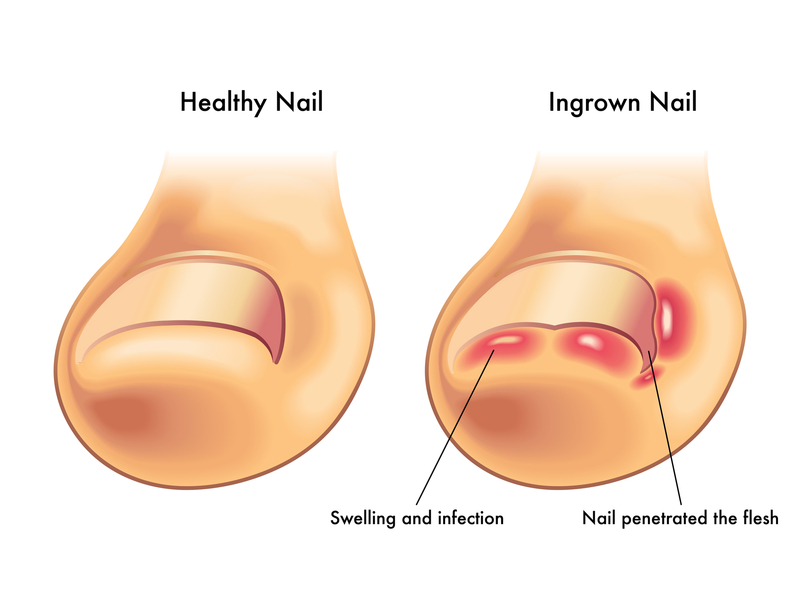 An ingrown toenail is when the nail grows into your skin instead of over it, like a normal nail should grow. This usually happens on your big toe, but it can happen to other toes, too. The problem with this pesky ingrown toenail is that it tends to get infected, leading to pain, redness, swelling and even pus. OUCH! No one is immune to getting an ingrown toenail, but adults get them more than children do, especially older adults. There are also several different causes, for example, cutting your toenail too short, wearing shoes or socks that don’t fit well (By now, you see this is a pretty common theme with the foot problems, right?! ), stubbing your toe, and even repeated activity from kicking a soccer ball. And how do you know you have an ingrown toe? Well, the pain for one. When the nail grows into the skin instead of over it, pain can definitely occur, and if the ingrown toenail gets infected, your toe may become swollen and red. Sometimes, ingrown toenails can be treated at home by soaking your toe in warm water for about 15 minutes a couple of times a day. Do this until the nail grows out and you’re able to safely clip it. That said, never, EVER attempt to use clippers or scissors to dig under the skin or nail – this never goes well, and can lead to infection. Also, don’t EVER attempt to drain any pus from your toe, again, because this can lead to a nasty infection. If soaking your toe doesn’t help within three days, call a podiatrist – better safe than sorry when it comes to infection, and of course, unnecessary pain. If you do end up at the doctor’s office, the good news is, more times than not, it’s easily treatable. Your doctor may give you antibiotics – I often do to prevent or treat an infection. If it’s really bad, I may recommend minor surgery to remove all or part of the ingrown toenail. If surgery is recommended, I’ll numb your toe, cut the edge of the ingrown toenail and pull out the piece of nail. It sounds horrible, I know, but trust me, it’s a WAY better option than letting it get out of hand and become infected. After surgery, I’ll give my patients individual instructions based on how extensive the surgery was. Normally, it’s soaking your toe in warm water, wearing a bandage, wearing loose-fitting shoes and taking over-the-counter pain relief like ibuprofen. While an ingrown toenail can indeed be insufferable, it’s relatively easy to treat and heal. If you do suspect you have an ingrown toenail and home treatment hasn’t helped, give me a call – as always, my #1 priority is to help put your best foot forward, again.